How do I add another user to my organization? I’m currently under a solo plan. You can add another user to your organization even if you’re in a Solo (1 user) plan by going to your “Members” page. Make sure you have selected the correct organization on the top right corner of the page. From there you should be able to temporarily disable time-tracking for your account. That way you free up a slot for another team member. Disabled members do not count against the plan’s limit. Click “Members” on the left menu. 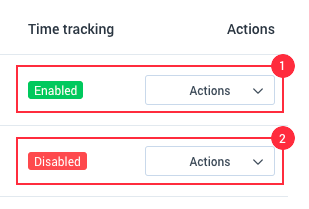 Click the “Actions” dropdown next to the user you want to disable time tracking for, then click the “Disable tracking”. 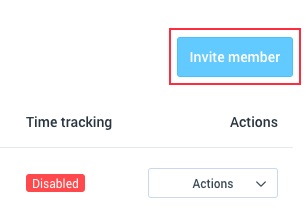 Once you’ve disabled time-tracking, you’ll notice that the “Invite member” button is still not clickable. Simply refresh the members page then click on the “Invite member” button. Once your supervisor or manager or client accepts your invite, disable time-tracking for them. Then you should be able to enable time-tracking on your account as you are the one who will track time, etc.